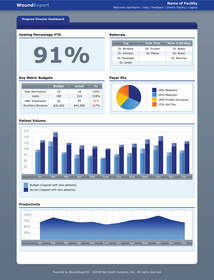 SOURCE: Net Health Systems, Inc.
PITTSBURGH, PA--(Marketwire - April 23, 2008) - SAWC & WHS -- WOCN -- Net Health Systems, Inc., a provider of integrated software for wound management throughout the care continuum, today announced the release of Personalized Dashboard Reporting, a new business intelligence service integrating enterprise reporting, analysis and continuous performance monitoring into a common reporting platform. With innovative, easy-to-use functionality, the Personalized Dashboard Reporting allows physicians, clinicians, and administrative users easier access to their data, enabling graphical analysis and support for improved clinical, operational, and financial decision-making. "Personalized Dashboard Reporting raises the bar again by providing the reporting, analysis, and business monitoring capabilities our users require as well as access to the data sources they need to improve business decision-making," said Christopher F. Hayes, Vice President, Information Technology. "Personalized Dashboards deliver on the promise of providing the right information, to the right people, at the right time." WoundExpert's scalable architecture -- from Outcomes Tracking through an Integrated EMR -- permits wound care service providers to establish and continuously monitor key performance indicators for success. Personalized Dashboard Reporting allows WoundExpert users to customize their home page, affording visualization of facility-relevant metrics and reports. "By pre-compiling and ordering reports by importance, Personalized Dashboard Reporting simplifies the process of reviewing, analyzing and correlating often time disparate data sources," concludes Chris. "Now, WoundExpert users can easily retrieve reports essential to their role in the delivery of patient care, empowering them with the information for improved outcomes, increased productivity and cost efficiency." About Net Health Systems, Inc.
Net Health provides integrated clinical, financial, regulatory software for wound management. Over 6,800 physicians, clinicians, and healthcare professionals across the U.S. use WoundExpert® (www.woundexpert.com) to improve patient care and facility performance. In 2007, WoundExpert clients utilized the software to document and support reimbursement for nearly $400 million in wound related services. The WoundExpert software is available as a fully integrated EMR for wound centers and an outcomes tracking and risk management system for in-patient, visiting, and telemedical environments. Headquartered in Pittsburgh, Net Health is celebrating its 15th year of operation. The company's mission continues to be validated both in being consistently recognized as on the of the best places to work in Western Pennsylvania and one of the fastest growing companies in the United States by Inc. Magazine. About this company Net Health Systems, Inc.
SAWC & WHS 2008 @ Booth #325. 40th Annual WOCN @ Booth #417.